Rollback turns are difficult because they involve so many skills. 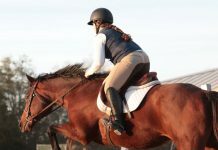 Riders need to look ahead and plan a turn after the first jump, then ride back to a second jump that’s often met on an angle. There’s a lot to do at once, yet you need to ride precisely and calmly. Set four cross rails, each one-quarter around a large circle in your arena. Start with a circle that’s the width of your arena–then tighten up the distance over time. If you want, you can practice the wagon wheel exercise with poles on the ground before you set the actual jumps. Pick up an organized, steady trot and trot the series. 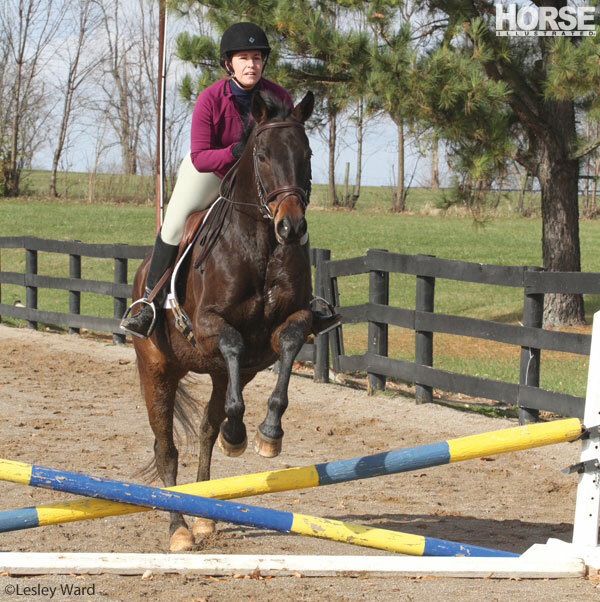 Don’t worry about how many strides your horse takes between the jumps. As you go over each jump, just keep continue to turn your head and look around the circle to the next jump. Use an opening rein to suggest what direction you want to turn, and keep your horse right in the middle of that circle, so he jumps the center of each “x.” If he speeds up, slow down; if he gets sluggish, add leg pressure. You have to react to whatever your horse does instantly because you don’t have much time until the next jump. Once you’ve practiced the circle several times in trot, try the exercise in canter. Previous articleWant to Judge Some Morgans? thx for this page!! my horse is amazing at roll backs but i can do it i just dont do it enough. im going to try this some time!! I never really gave rollback any thought. I knew that I had to be planning my attack to the second jump while I was executing my first jump. So I made a point to begin turning my head on the backside of the first jump, aligning my eyes and with the centerline of the attack to the second jump while simultaneously opening my inside rein. Works like a charm every time, no matter how many degrees the angle.